Thermo Scientific Phusion U DNA polymerase is a novel engineered high fidelity enzyme developed using fusion technology. Due to a proprietary mutation in the so called dUTP binding pocket of Phusion, Phusion U overcomes an important limitation of proofreading enzymes - it is able to incorporate dUTP and read through uracil present in DNA templates. In addition to uracil usage possibility, Phusion U features all the superior properties of other Phusion DNA Polymerases - great accuracy, speed, ability to amplify long amplicons up to 20 kb and a high specificity with Affibody based hot start . 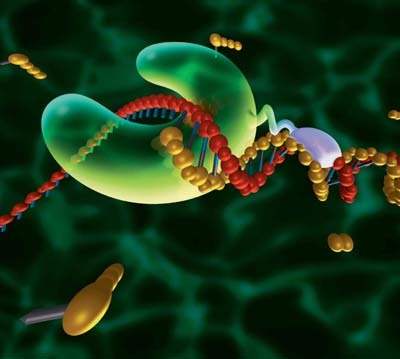 These features make Phusion U Hot Start DNA Polymerase an excellent choice for such important applications as amplification of bisulphite-converted or damaged DNA as well as use of carryover contamination control. Phusion U Hot Start DNA Polymerase is also available in the Master Mix and Green formats. Phusion U Hot Start PCR Master Mix is convenient 2X mix designed to minimize the number of pipetting steps. Only template and primers need to be added by the user. Phusion U Green format is a combination of Phusion U Hot Start DNA Polymerase and 5X Phusion Green Buffers. The buffers include a density reagent and two tracking dyes for direct loading of PCR products on a gel. The colored buffer does not interfere with Phusion U performance and is compatible with downstream applications such as DNA sequencing, ligation and restriction digestion. •Specificity - hot start for reduced nonspecific amplification and primer degradation. Both Phusion HF Buffer and Phusion GC Buffer provide 1.5 mM MgCl2 in the final 1X concentration. Both Phusion Green HF and Phusion Green GC Buffer provide 1.5 mM MgCl2 in the final 1X concentration. > Storage buffer:20 mM Tris-HCl (pH 7.4 at 25°C), 0.1 mM EDTA, 1 mM DTT, 100 mM KCl, stabilizers, and 50 % glycerol.